Have you heard about VersionPress before? This plugin can only be found on GitHub as it is not yet released in the WordPress database. The plugin is still in its testing stages so it continues to get better with feedback from the WordPress community. VersionPress is a WordPress version control plugin with unique features that you may soon want for your blog. What this plugin does is that it uses the Git folder in the root of your blog thus allowing you to undo changes quickly from the WordPress dashboard. Since I am always tweaking the blog with sometimes making a mistake which involves needing to undo a change or undo the last couple of changes to start over. VersionPress is the answer to undoing all changes very quickly. Let’s get to the actual plugin because it will help you understand what this plugin can do for you. 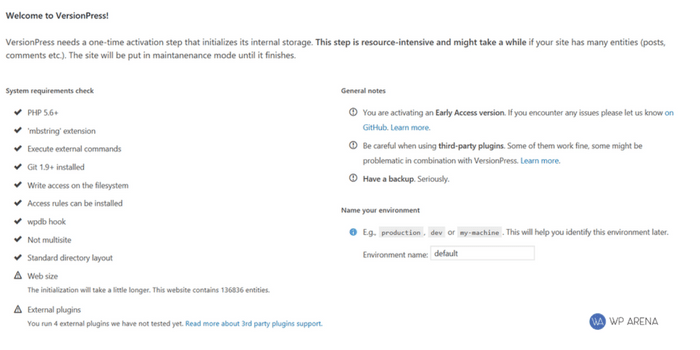 After downloading and installing the VersionPress plugin, you should now be on the following screen below. Below the page above, there is an activation button to click on. It may take several minutes for the process to finish depending how much content is on the blog. Make sure you do not close the current page you are on. When the activation is completed, you may not see anything on the dashboard if you haven’t changed anything yet. Start editing a few blog posts then revisit the dashboard to see that you can quickly undo those edits. This works on editing the theme files and much more. As you can see above, the recent changes I just did, I can either roll back or completely undo with a click of a button. This is a little better than restoring a backup that can take more than a few minutes. Just click on undo changes and click the “OK” button. Make sure you are confident you want to do that undo before confirming it. After the process is completed, this is what the VersionPress dashboard looks like now. It lets you know what you just did and do you want to undo that change? The toolbar has a warning message that will expand if clicked on to remind you that the plugin is in its early stages. Not all plugins that you have installed may work in conjunction with what this plugin does but get in touch with support if any issues so the plugin can get updated to fix that problem. When the code has changed on your blog, you don’t always remember exactly what has been removed. VersionPress will actually show you. Click on any change that you made and then click on the Full Diff button to see this. Here is an example below. This plugin is great for any blogger to have who is always tweaking things on the blog and want a way to reverse the changes quickly. If you would like a more depth information about this plugin, have a look at the following guides below.